According to their Education Program in War Relocation Centers booklet, the War Relocation Authority (WRA) acknowledges that 27,700 out of the 110,000 Japanese American internees during World War II were schoolchildren who were “American citizens by birth.” They stated that their primary purpose for the schools within the Japanese American internment camps “was to enable these young citizens to make acceptable educational progress” and “[maintain] an understanding of American ideals, institutions, and practices” while removed from average American life (WRA 1). It is ironic that the United States government offered an education promoting democracy and “American” principles to citizens it kept in detainment. Did the 27,700 schoolchildren recognize this irony while attending the internment camp schools? If so, how could this have affected their personal formations of their identities as American citizens and as Japanese Nisei? In regard to the Japanese American children in internment, this irony complicates racial identity and presents a “two-faced discourse of American national belonging,” as discussed in the introduction of Emily Roxworthy’s The Spectacle of Japanese American Trauma: Racial Performativity and World War II (14). While understanding that they cannot speak for their entire communities, I will examine the Densho Archive interviews of former Minidoka internees Henry Miyatake and Betty Morita Shibayama alongside Roxworthy’s ideas about racial performativity and performative citizenship in order to explore the conversation between camp school education and the Japanese American child’s own identity formation. I will also engage the concepts of “education” and “identity” as explained in Keywords for Children’s Literature to frame this exploration. In the “Education” entry of Keywords to Children’s Literature, Elisabeth Gruner quotes Richard Shaull’s foreword to Paolo Freire’s Pedagogy of the Oppressed (2000) to explain that education either helps youth conform to the present societal structures in place or helps them “deal critically and creatively with reality and discover how to participate in the transformation of their world” (Shaull qtd. in Gruner). Gruner goes further to suggest that education has always done both. However, the education that was offered in the Japanese American internment schools seemed to primarily do the former. Indeed, Japanese language and cultural classes were offered in the internment camps, but the education commissioned by the U.S. government did little to offer or encourage critical discourse on the reality of Japanese American internment and the state of the Japanese race in the United States. Therefore, for Japanese American schoolchildren, this integrating education could participate in the crafting of their identity. "The disparity between what Japanese American schoolchildren were being taught and what they were experiencing while in internment creates a rift in their identities..."
Betty Morita Shibayama Interview Segment 23: "Attending grammar school in Minidoka..."
In her interview with Alice Ito about attending grammar school in the Minidoka camp starting in the fall of 1943, Betty Morita Shibayama recounts, “I know we said the Pledge of Allegiance every day” in response to Ito’s question about whether Minidoka teachers emphasized democracy and Americanism (Shibayama). Aside from that, she only remembers when war hero Ben Kuroki visited the camp and people came out waving flags; she agrees that day left an impression on her. Shibayama’s experience illustrates the myth of performative citizenship at work within the camps. Reciting the Pledge of Allegiance, a speech act of U.S. performative citizenship, was most likely carried over from the institutionalized, daily ritual in American public schools outside of the camp. This indicates that the education she received both before and during internment was meant to attune her to societal structures rather than spark criticism of her situation. But while inside the camp, this speech act counters the promise that “American citizenship is officially and effectively conferred upon any individual, regardless of race or national origin, based simply upon the performance of a codified repertoire of speech acts and embodied acts” (Roxworthy 13). Additionally, Ben Kuroki, a Nisei combat pilot awarded the Distinguished Service Medal, was often sent to the camps to encourage internees to serve in the U.S. military. Roxworthy lists “enlistment in the armed services” (13) as part of the repertoire of performative citizenship, and Kuroki’s dispatches to the camps as an advocate would have perpetuated the injustice that the myth hides. Even Shibayama’s memory of people welcoming him with the waving of American flags implies the “extra” performances required of the detained Japanese Americans to indicate their U.S. loyalty and validate their U.S. citizenship. "Reciting the Pledge of Allegiance, a speech act of U.S. performative citizenship, was most likely carried over from the institutionalized, daily ritual in American public schools outside of the camp...But while inside the camp, this speech act counters the promise that 'American citizenship is officially and effectively conferred upon any individual, regardless of race or national origin, based simply upon the performance...'"
"San Francisco, Calif. April 1942 - Children of the Weill public school." Dorothea Lange. Prints & Photographs courtesy of Library of Congress. The fact that these two events remain impressed upon Shibayama’s memory when asked about camp education’s focus on American democracy indicates the discrepancies in her racial identity as a Nisei child in internment. Seeing her community bring out flags to excitedly greet a Nisei fighting for the country imprisoning her left a deep impression and may have confused her identity formation as a child entering the fifth grade at Minidoka. If members of her community were fighting for the United States and claiming “liberty and justice for all” daily, why were they kept in camps? With the myth of performative citizenship, discovery of one’s identity was no longer “[achieved] through looking inward…but instead emerges at the nexus of a set of discourses—of race, gender, ethnicity, class, and so on—that one uses with degrees of submissiveness of subversion to fashion a provisional performance of the self” (Coats). To extend upon Shibayama’s experience with the intersection of performative citizenship and race, I would revise Roxworthy’s adaptation of Judith Butler’s idea of performativity within gender theory: “the unconscious (or even conscious) enactment of codified acts would seem to have little impact because race will be predetermined through the reading practices of the interracial observer” (12). Henry Miyatake Interview II, Segment 16: "American Democracy and What It Means to Me..."
As for the literal “reading practices of the dominant observer,” Henry Miyatake’s Caucasian advisor and teacher in Minidoka, Miss Amerman, exercised them while assessing his term paper for her Civics course during his high school junior year. In doing so, she rebutted Miyatake’s efforts to utilize his education for transformation by evaluating his reality critically and pushed the education for integration by directly instructing him to conform. In his interview with Tom Ikeda titled “American Democracy and What It Means to Me: a term paper and an act of civil disobedience,” Miyatake recalls the term paper and ensuing discussion with Miss Amerman that would prove to be poignant to his identity formation. Unlike Shibayama, who had been at the elementary grade level while in internment and who was confused in her identity formation by what she learned through observation, Miyatake was downright frustrated in his identity formation by what he learned through lesson.Miyatake believed that “Miss Amerman felt her mission was to teach us American Democratic practices right down the line, even though we were inside the camp.” He states that “she did [such] a good job of teaching us…the Constitution of the United States and how the government works…that I took it upon myself to really read the Constitution,” and that his term paper became “a collection of all my frustrations about being in the camp, and all the things that really caused me concern about what was happening to us” (Miyatake). Amidst those frustrations written in his paper, he had mentioned the discriminatory treatment against African Americans in the South as well, displaying an inherent understanding of the racialization of performative citizenship. A clip of Henry Miyatake's interview "American Democracy and What It Means to Me: a term paper and an act of civil disobedience," courtesy of the Densho Project YouTube channel. The full interview segment is available here and through the link above in the Densho Archive. Miyatake reveals that he had genuinely thought Miss Amerman would be proud to see his critical interpretation of the Constitution and of the present state of American democracy; this genuine intention implies that his term paper was not one of rebellion but rather one reflecting upon his own identity formation in the midst of a conflict in his education about citizenship and his experience of performative citizenship. Miss Amerman would not accept his paper and told him that she was disappointed in how he was “trying to completely upturn this whole thing that we’re trying to educate you on” when “we’ve taught you the civics in this class and I was expecting a paper that would say…you empathized with…the principles that were given” (qtd. in Miyatake). Miss Amerman, even in using “we,” takes up representation of the U.S. government’s expectations for the compliance and performativity of the Nisei. Miss Amerman then classifies him as a student who has gone from “very good” to “not-so-good” in his three years of schooling in Minidoka and threatens to fail him. Miss Amerman’s reaction seems to agree with what Roxworthy claims was the illusion of American democracy that the myth of performative citizenship reinforced: “the internment policy resulted from the suspicious behavior of Japanese Americans…rather than from a historical ideology of biological racism that tied U.S. democracy to European fascism” (Roxworthy 14). Miss Amerman’s reaction to Miyatake’s term paper is an indication of her own inherent racism as part of the dominant culture, and she could have seen Miyatake’s “revolutionary” paper as a document suspicious of Japanese loyalty rather than a high school boy’s professed reflections on the undemocratic withholding of his citizenship by a supposedly democratic government. While Shibayama and Miyatake were at different stages of childhood while at Minidoka, they both encountered the incongruence of their education, their citizenship and their status while attending school in internment. Neither explicitly expressed knowledge of performative citizenship or a recognition of their experiences as identity formation, but both former internees displayed these inherently when their testimonies are considered in conversation with Roxworthy’s ideas of performativity and under the framing of Keywords for Children’s Literature’s conceptions of education and identity. Shibayama and Miyatake both faced Roxworthy’s myth of performative citizenship when seeing how their identities as Nisei counted as American citizens and the education they received about American democracy and citizenship directly clashed with the internment and discriminatory treatment of their community during World War II. I examined former internees’ personal testimonies to explore the Japanese American child’s own self-identity formation while attending the camps schools, which corresponds to the consideration of the American government and public’s identity formation of the Japanese American child in the camp schools (as analyzed by my colleague Kylie Baker). In regards to areas for further study in my particular topic of exploration, I understand that the interviews I studied were mere segments of an entirety. Perhaps more testimony about experiences within the camp schools or experiences of identity formation while in internment would have been recorded in other segments which would be worthy of further study. Additionally, in consideration of Gruner’s belief that “education” is a catalyst of transformation within the context of children’s literature, I felt that this definition aligns with the goals of multicultural education today. I believe an investigation of the modern-day Japanese American child’s identity formation based on how the U.S.’s current curriculum on World War II and Japanese American internment would thus prove to be interesting. Coats, Karen. “Identity.” Keywords for Children’s Literature. New York: New York University Press, 2011. Credo Reference. Web. 14 November 2014. Densho Encyclopedia contributors. "Ben Kuroki." Densho Encyclopedia. 19 Mar. 2013. Web. 15 November 2014. Gruner, Elisabeth. “Education.” Keywords for Children’s Literature. New York: New York University Press, 2011. Credo Reference. Web. 14 November 2014. Miyatake, Henry. Interview by Tom Ikeda. Henry Miyatake Interview II. Densho. 4 May 1998. Web. 5 November 2014. Photograph No. A-76 (Photographer Dorothea Lange); “San Francisco, Calf., April 1942 – Children of the Will public school, from the so-called international settlement, shown in a flag pledge ceremony. Some of them are evacuees of Japanese ancestry who will be housed in War relocation authority centers for the duration,” April 1942; Library of Congress Prints and Photographs Division, Washington, D.C.
Shibayama, Betty Morita. Interview by Alice Ito. Betty Morita Shibayama Interview. Densho. 27 Oct. 2003. Web. 5 November 2014. War Relocation Authority. “Education Program in War Relocation Centers,” (denshopd-p155-00015). The Merrill Family Collection. Densho. Ainee is a junior English major and Educational Studies minor at Emory University. She is looking to pursue teaching multicultural education at the secondary and post-secondary levels. Ainee is beginning to form her concentration in English and is leaning towards Multicultural American Literature, which this ENG 389: Figure of the Child in Multiethnic American Literature & Activism course has partly inspired and will help fulfill. 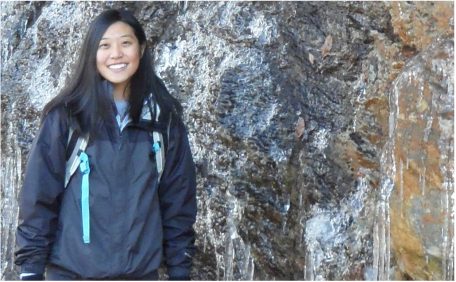 For this project specifically, she was deeply interested in how the education of World War II affected the Japanese American youth; the exploration of the Densho Project also sparked her interest in how multiethnic American history may be presented and taught in today's schools.